We provide Air Conditioning Service & Installation, and Air Conditioner Repair & Maintenance, in the Dillsburg, Mechanicsburg & Camp Hill PA areas (York and Cumberland County in Central PA). We service all air conditioner makes and models, including Rheem, Ruud, Honeywell, Carrier, Goodman, York, Payne, Amana, Trane, and more. 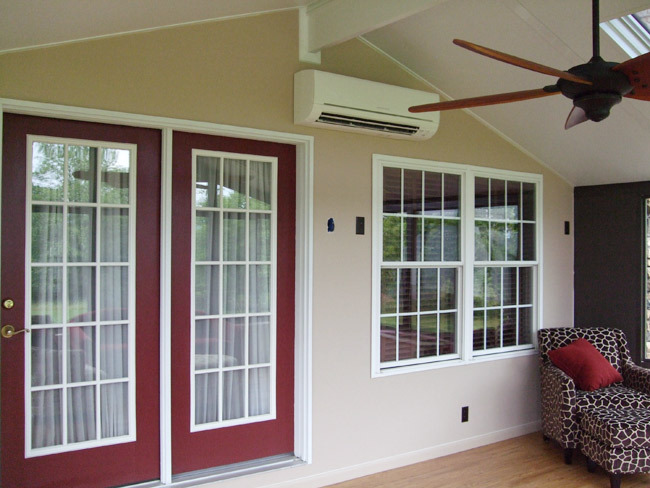 We install Ductless Split Systems (also called Mini-Split Systems), which are small and flexible and allow zoning for heating and cooling in individual rooms. Each of the zones has its own thermostat, so you only need to heat or cool that space when it is occupied, saving energy and money. Mini-Split systems have no ducts, making them even more energy efficient. And they're perfect for older buildings where installing ductwork would be challenging. One of the most frequent complaints we receive is, "The other company always added Freon™ when they came to service our unit." We have studied leak detection for many years and feel that we are unmatched in our ability to find and correct refrigerant leaks. We know which equipment works and which doesn't. We strongly suggest annual air conditioning maintenance, which can help avoid many problems before they arise and keep your air conditioner system in peak operating condition. 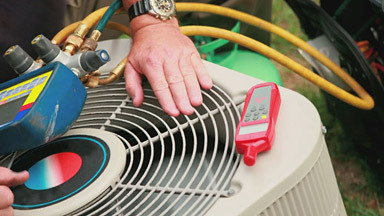 Some of the services we perform with our annual air conditioner maintenance include checking thermostat calibration, replacing air filters or air cleaner media, checking evaporator and condenser coils for excessive dirt accumulation, disassembling outdoor unit and washing dirty condenser coils if necessary, checking blower and condenser motor brackets for breaks or cracks, checking setscrews on fan and blower wheels for tightness and centered in housing, checking blower wheels for excessive dirt and washing blower wheel and housing if necessary, checking refrigerant charge pressure and temperature, checking superheat and sub-cooling, checking compressor terminals for overheating due to lost continuity, inspecting controls and safeties for proper operation, checking compressor contacts for pitting or burning, lubricating motors and bearings if applicable, checking for burned wires and terminals, checking and tightening electrical connections, checking condensate drain for blockages, inspecting exterior of equipment and replacing any missing screws to prevent air leakage, checking defrost controls, and checking system overall operation.